The DMACK ST Trophy championship reached it’s finale last weekend on Trackrod Rally Yorkshire and it was Tobermory’s Alasdair Currie who ended the season with a win after tying on time with Richard Wells. Currie and co-driver Steven Brown got their event off to a great start, setting fastest time in the long Langdale stage ahead of 2017 title winner Sam Bilham. Currie maintained his leading position in Staindale but it was Richard Wells and Calvin Houldsworth who were quickest in the stage, moving up to second on the Fiesta leaderboard. Stages in Gale Rigg and Cropton were up next. Currie was fastest in Gale Rigg but only by 0.8 seconds from Wells. With his car back in good health it was Bilham who was quickest in Cropton. Going into the last stage, in the notoriously tough Dalby forest, it was all to play for as Currie led Wells by just 5.2 seconds. In a very dramatic finish Wells beat Currie by exactly 5.2 seconds which meant that the two crews ended on the same time, Currie being classed as the victor on a tie-break ruling which gave him second overall in the championship and the prize of using a Castrol-backed Fiesta R2 on Wales Rally GB. Finishing third of the DMACK ST Trophy crews was Jon Ambler and Simon Jones who were challenging for third place on the end of season leaderboard. After his problems in stage two Bilham finished in fifth place with the other Fiesta entrant, Martin Laverty, having to retire following a troublesome day which included power steering issues and an overheating engine. 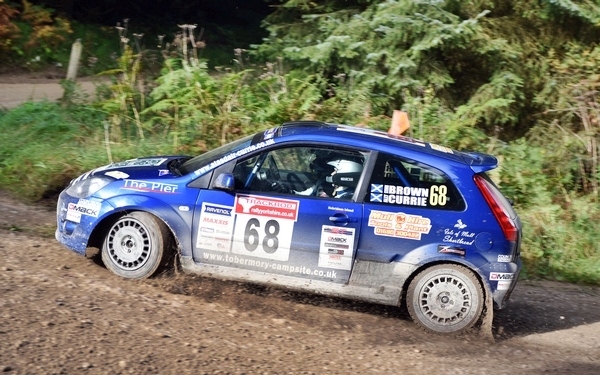 Please visit www.sttrophy.co.uk or www.facebook.com/fiestasttrophy for more information on the DMACK ST Trophy.